A Lady Broncs base runner narrowly slips past the tag of Maiden Emilie Corley. Maiden outfielder Julia Daley makes a play at the ball. Ronan Maiden Madison Clairmont makes contact. Ronan Maiden Macao Jackson winds up for a pitch. 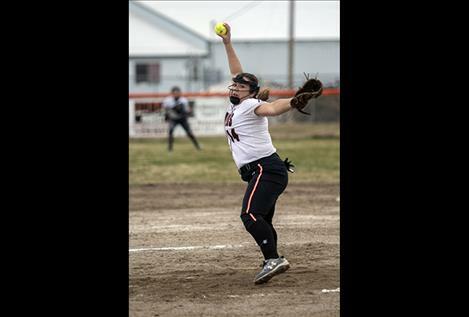 RONAN — The Maiden High School softball team ran into some nasty weather and a talented Frenchtown squad this past weekend in their 2019 season home opener. 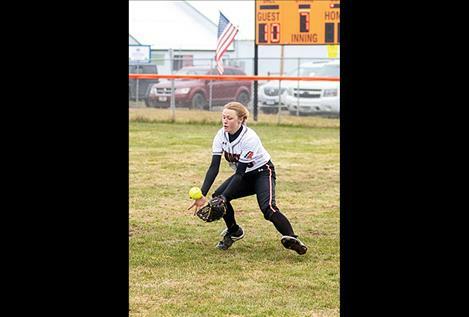 On Friday afternoon, the Maidens scored three runs in the first inning against the Columbia Falls Wildkats before heavy rains forced a 30-minute delay and eventual postponement of the game. 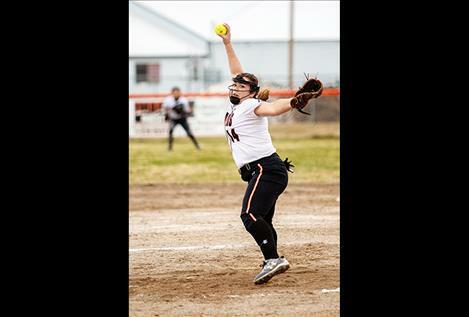 In Saturday’s home matchup against the Frenchtown Lady Broncs, the very young Maiden squad kept playing hard but fell 15-1. Frenchtown jumped ahead early in the game, scoring seven runs in the first three innings. Maiden Emilie Corley pushed the only Maiden run across the plate with a bases-loaded sacrifice fly in the third inning. 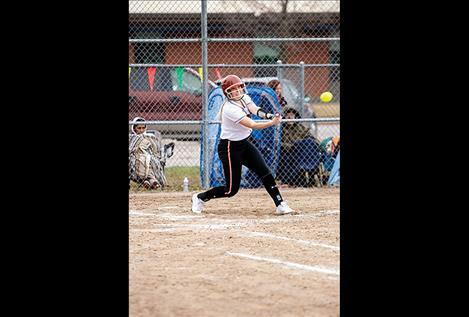 The Maidens held the Lady Broncs scoreless in the fourth and fifth innings. Mahkuk led Ronan with two hits, including a stolen base. Big Beaver and Corley each collected a hit. Inside the circle for the Maidens, Macao Jackson pitched a complete game, walking six and striking out four. She allowed 15 runs on 17 hits. 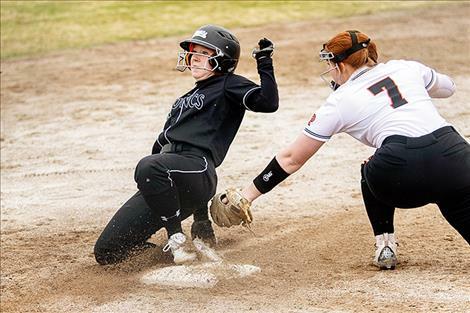 The Maidens return to action April 10 when they face Corvallis on the Lady Griz softball field in Missoula. HR – Garren, Moen, Bagnell. SF – Corley; *Moen. HBP – Bauer. BB – M.Clairmont, Jackson, R.Clairmont; Bagnell, Habeck, Moen, Arthur 2, Rebich 1.